Andy Fletcher left Friday's Yankees-Red Sox game following a lower leg injury sustained while making a call on a ball hit off the Green Monster at Fenway Park. 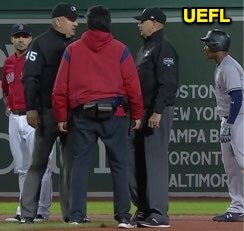 In the top of the 4th inning, Yankees batter Miguel Andujar hit a fly ball to the left field wall, fielded by Red Sox outfielder Andrew Benintendi, who threw to second baseman Ian Kinsler as Andujar slid into second base, Fletcher ruling the runner safe as he hopped back to the infield, appearing to favor his right calf. Fletcher subsequently left the game, as 1B Umpire Manny Gonzalez and 3B Umpire and crew chief Jeff Nelson managed the bases with HP Umpire Laz Diaz remaining behind the plate.